I’ve used this Specialized shoe now for a good five months and it’s time for an update and a verdict. The short of it is, it’s an awesome shoe that covers all the bases that a flat shoe should deliver. It descends well, jumps good, climbs decent and is comfortable on and off the bike. The shoe seems to have the right amount of grip, as it’s not quite Five Ten shoe sticky, but it is grippier than the Tevas. We’ve used it with an assortment of flat pedals and it performed well with all of them. Durability is good too, as a quick glance at the sole shows some marks, but not any significant damage. In summary, this is one of the best flat shoes we’ve tried and it deserves the coveted 5-star rating. Climbing, this shoe performed well. It seems stiff enough and we never felt the shoe held us back on big climbs. The key as well is, this shoe is incredibly comfortable so the absence of pain and hot spots helped us out on the long days in the saddle. The pedal is roomy indeed and we just had to cinch up the laces each time to get that snug control needed on the big, rocky descents. One of the advantages of the roomy cavity is that we were able to select the high arch sole that we needed for proper support, and this did not compromise fit. One of the minor inconveniences is, the heel support had a foam insert that could be displaced if we shoved our foot in the shoe without properly loosening them. Care had to be taken to loosen the shoe properly before inserting the foot. Beyond that, that cushy heel support held the heel in place without calling attention to itself. The elastic lace holder was not the easiest to use, as one had to lift the elastic and insert the tied shoelace through to prevent any movement of the shoelaces. But it was well worth the effort each time, as the laces never loosened or got caught in the chainrings. Off the bike, the shoes were a champ. 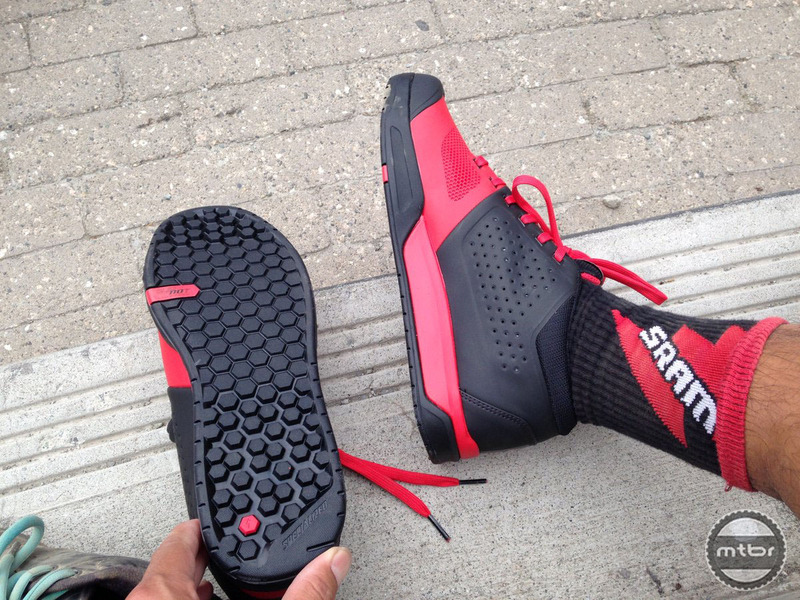 Climbing granite rocks, slippery logs or walking to the cafe were all handled with ease by the Specialized 2FO. 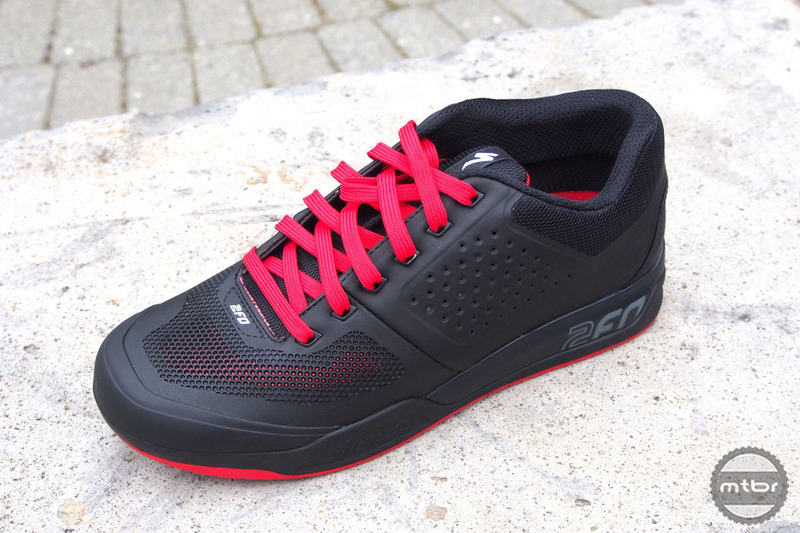 A great testimonial to this shoe’s comfort is that we keep it on sometimes after a ride. Going to the brewpub, driving home, the shoes feel comfortable all day. Unlike bulky or harsh shoes that you can’t wait to get out of, these shoes provide all day comfort. We’ve nailed some rocks and stumps with this shoe and although the foot hurts a few seconds/minutes after a big impact, we’ve suffered no injuries. By the end of the ride, it’s all good and the shoe shows marks but no damage from the beating. The shoe is fairly light as well at 395 grams each. At that weight, the shoe offers good protection on the toe box area. The rest of the foot is well protected as well. When the shoe gets wet, it doesn’t get waterlogged too much and it dries faster than other flat shoes. Let’s give the 2FO (Foot Out, Flat Out) five flamin’ chilies for a well executed flat shoe. NOT surprisingly over priced… good luck with all of the better priced proven options that already exist. Wish I was a rich kid when I was young, they got all the cool stuff and my dad could only afford Converse All Stars. . .
Salve vorrei sapere se la 2fo clip la posso trovare blu e giallo fluo. Grazie mille! I wish someone would come out with more of a running shoe design with an arch for support that would work for trail and XC. This is a flat that looks like all the rest; basically another version of a skate shoe. I get that this works well for DH but I would like to see something for the trails that is shaped like a contoured shoe. FiveTen has hiking shoes that come very close. Also, its time for laces to go away. Why not straps or tension adjusters? I took an old pair of Shimano buckle shoes, ground down the cleats and glued on some Five Ten soles. This has worked great for about 750 miles. I like being able to ratchet the tension and the secure fit. I hear what you are saying, virtually everything you desire is on clip less pedal shoes, non skate look buckles and ratchets… Contoured shoes will still need a flat sole if you require them to be used on flat pedals. Personally I cannot stand buckles straps etc… I’m not skiing! Anyway, don’t shimano make a flat shoe type with has a less skate shoe appearance? The one with the velcro lace cover? Bought a pair of 2FO Flat a couple of months ago and I have around 50 hours on it, half tarmac (transiting to and from the trails), half dusty country roads (hard pack). Grip is terrible and the sole shows already severe damage. This while riding with a trail bike. No downhill. No freeride. No jumps. The sole is simply too stiff and the flat pedal pins friction ruins it at an alarming rate instead of being flexible enough to jump back to its form when alleviating pressure on the pedals. Either I got a lemon (bad batch, wrong sole compound) or most glowing reviews of these shows are mainly marketing in disguise. It’s a pity if that’s the case, however, as other than the sole, they are great. I agree with all you’ve said. Mine had the same issues as yours, maybe I ride more than you, but the soles of mines were ripped, to the point you can see the iner layer of the shoe, in 1 and a half month. I dont recomend those to anyone. By the way, had similar isues with 2014 freeriders, but those lasted a little more than half a year. Next I’ll be trying shimano AM7. the 5.10’s are way over rated. they are heavy and hot. I’ve tried them not I’m looking for something that’s worth the money.